In 12-inch nonstick skillet, heat oil over medium-high heat. Add chicken; cook and stir 5 to 6 minutes or until no longer pink in center. Reduce heat to medium. Stir in 3/4 cup of the water, stir-fry seasoning mix and peanut butter until smooth. 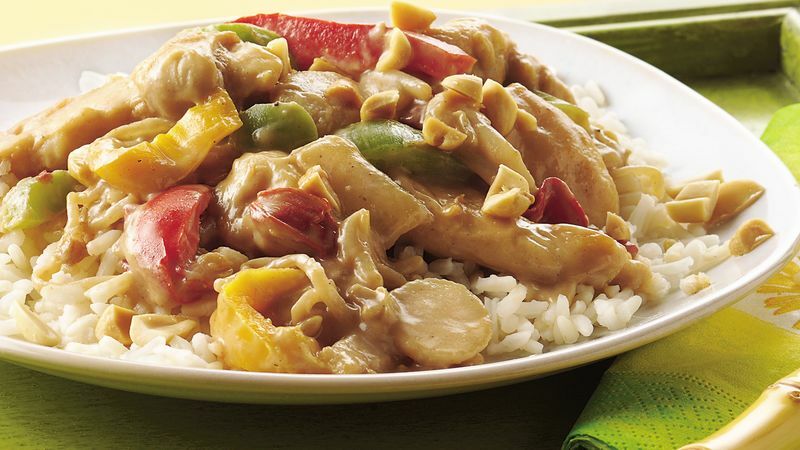 Stir in vegetables and bell pepper and onion stir-fry; cook and stir until thoroughly heated. Meanwhile, cook rice in remaining 2 cups water as directed on package. Serve chicken mixture over rice; sprinkle with peanuts. If chicken breast strips are unavailable in the fresh poultry counter, cut boneless skinless chicken breasts crosswise into strips instead. Purchase fortune cookies for dessert.